If you’ve ever returned to a childhood home after years away, you remember how things shrank. Homes, schools, parks, neighborhoods, distances. The formerly gigantic fence you dreamed of climbing over to escape for an adventure hits you about shoulder height. The trees may be taller (or gone entirely), but other things are smaller. That sense of things being smaller than I remembered didn’t hit during today’s ride through a tiny bit of my old stomping/commuting grounds in Spokane, though, roughly 19 months after moving to Seattle. What’s gotten bigger? The bike connections, that’s what. What with set-up for the Spokane Bike Swap that runs Saturday and Sunday I didn’t have time to check out every new connection I want to ride. 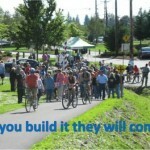 The new Spokane River Centennial Trail connection through Kendall Yards is still on my list but I’ll ride that Sunday with Belles and Baskets. I rode just a tiny bit of what used to be an everyday route from WSU Spokane at the Riverpoint Campus on the Spokane River up the South Hill. When I turned south up Sherman Avenue, which takes me over the freeway between Sprague and 5th, lo and behold: new bike lanes! 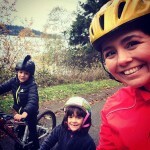 They complete a connection with the bike lanes installed on Sherman and Southeast Boulevard farther up; the city finished those not longer after we moved to that neighborhood and our whole family rode in a celebration with the mayor and neighbors. Bike lanes do still come to an end (and sidewalks could use some work in places) but the connections are growing. 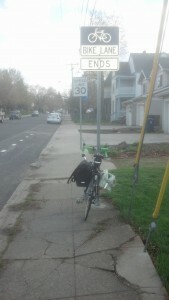 For 6 years I rode to work on a bike lane that came to a stop sign preceded by “BIKE LANE ENDS” signage. Note that bicycling does not end at this point — just the lane. Now that lane continues. It connects with an east/west lane running along 5th — a low-traffic street and a connector paralleling the south edge of the freeway. My usual route home lay up the hill, but I rode 5th regularly to reach the South Perry Farmers’ Market before going home. To catch up with my sweetheart for a date at South Perry Pizza. To shop at Title Nine and Two Wheel Transit. Or, as today, to stop at The Shop for some good locally roasted coffee. Spokane’s network isn’t complete by a long shot. No city or town today can claim a complete network clearly designed and signed for people on bikes to get where they’re going as an accepted element in traffic. 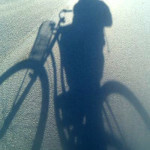 But riding on that new bike lane I felt as if my home had gotten bigger, not smaller, while I was away. Keep rolling, Spokane. Have you gone back to bike somewhere you used to ride regularly? What did you notice most? 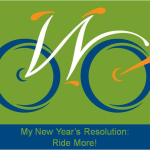 This article was posted in Attitudes, Commuting, Infrastructure, Spokane County. Bookmark the permalink. Follow comments with the RSS feed for this post. Both comments and trackbacks are closed.